Justin Favela, Recuérdame (detail), 2018. Photo by Michael Palma Mir. Recuérdame, a new mural by Las Vegas-based artist Justin Favela, commissioned by Sugar Hill Children’s Museum of Art & Storytelling, is a celebration of Mexican history and culture through the lens of landscape. 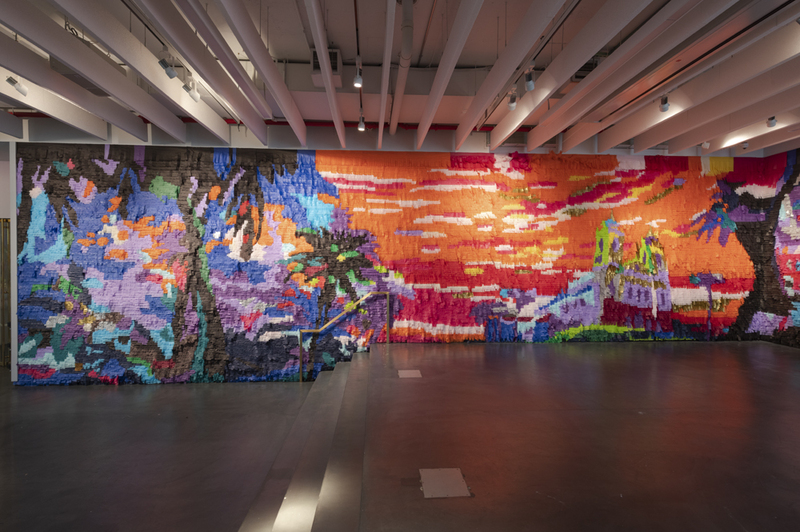 Organized by guest curator Petrushka Bazin Larsen, Favela’s murals take visitors on a phantasmagoric adventure, rending the Mexican landscape in piñata-cut tissue paper. From the imagery found in Jose Maria Velasco’s expansive 19th-century canvases, to Walt Disney’s 1944 live-action animation film The Three Caballeros and 2017 Pixar animated film Coco, Favela covers over 1,000 square feet of the Museum in a full array of chromatic hues. The result is a larger-than-life immersive environment that recalls some of Favela’s memories of driving through Mexico’s countryside during his visits as a child, as well as contemporary cinematic references that were created for both Latin-American and non-Latin-American audiences to celebrate and exoticize Mexican culture. Justin Favela: Recuérdame will be on view from October 17, 2018 through September 8, 2019 This exhibition will be accompanied by a host of storytelling programs and artmaking activities inspired by the artist’s use of materials, a celebration of Mexican culture and the delight affiliated with piñatas. Justin Favela is a Las Vegas native with a Bachelor of Fine Arts degree in Studio Arts from UNLV who works in the mediums of painting, sculpture, and performance. His work draws from art history, popular culture and his Guatemalan/Mexican heritage. He has participated in exhibitions and been awarded artists residencies across the United States, Mexico and the United Kingdom. Recent exhibitions of note include Unsettled at the Nevada Museum of Art in Reno; Mi Tierra: Contemporary Artists Explore Place, at the Denver Art Museum, and the group exhibition Shonky: The Aesthetics of Awkwardness touring the United Kingdom through 2018. His installation at Sugar Hill will be the artist’s New York City debut. Favela is also the co-creator of the podcast Latinos Who Lunch. Justin Favela is also the 2018 recipient of the Alan Turing LGTBIQ Award for International Artist.